The Naples National Archaeological Museum (Museo Archeologico Nazionale di Napoli) is a museum in Naples, at the northwest corner of the original Greek wall of the city of Neapolis. The museum contains a large collection of Roman artifacts from Pompeii, Stabiae and Herculaneum. The collection includes works of the highest quality produced in Greek, Roman and Renaissance times. 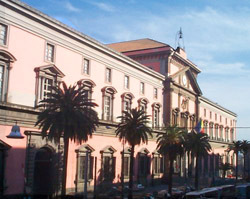 It is the most important Italian archaeological museum. The museum hosts extensive collections of Greek and Roman antiquities. Their core is from the Farnese Collection, which includes a collection of engraved gems (including the Farnese Cup, a Ptolemaic bowl made of sardonyx agate and the most famous piece in the "Treasure of the Magnificent", and is founded upon gems collected by Cosimo de' Medici and Lorenzo il Magnifico in the 15th century) and the Farnese Marbles.